We can provide you with all your industrial abseiling access building maintenance needs and requirements from concrete repair, high rise painting services, anchor point installation, industrial rope access facade surveys, height safety installers needs, anchor point testing and certification and much more. Please contact our Project Manager Jim at 0420574305 for further information or click here to go to our Contact Us page. We have a special offer this month for first time customers, just mention this code: ASG442 to recieve the discount. Our expert team of industrial rope access abseiling personnel can access any part of a building to carry out various tasks to help you with your full building maintenance solutions. All access is from ropes as the use of Industrial Rope Access gives us the opportunity to provide you with a cost-effective solution for all your maintenance and height safety needs whether it is a small rendering job to painting a whole building. 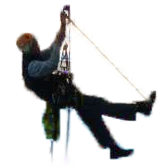 We can do it all for you and all from rope access used by our specalists abseiling contractors, abseil painters and various other qualified trade skills combined. With our abseiling personnel, we can provide a complete solution for any of your maintenance needs at a cost-effective rate. We specialize in providing access to high-rise buildings with difficult access through our rope access painting system. We also provide many other service with the same access procedure for facade repairs including treatments of concrete cancer, spalling repairs and all other external facade maintenance like expansion joint sealing and facade re-caulking with Sikaflex Mastic Sealers are possible to be accomplished with ease through our Industrial rope access technique. We have rope access technicians that are qualified in their respective fields from electricians, plumbers and concrete repairs specialists to handle all the jobs you need to be done. Industrial Rope Access is the most cost effective way to carry out facade maintenance, without the need for expensive EWP (cherry pickers) or obtrusive scaffolds because we utilize abseiling access techniques to perform external facade maintenance including rope access painting and abseiling access facade coating, concrete repairs, rope access spalling repairs, industrial rope access window cleaning and any other type of facade maintenance you can imagine. We can offer you abseiling access services to accomplish any type of building maintenance task from facade painting, window cleaning, concrete repairs, rope access sign installation, technical rigging, stunt rigging and much more. Please inquire for more information, you can contact us by clicking here. Advanced Solutions Group’s Team understands the requirement to work within the budget as required by most of our clients. Some other aspects may be expensive because of the way the job areas are accessed, whereas our experience in the use of industrial rope access and building maintenance solutions provide our clients with an invaluable as well as cost-effective resource for facade maintenance. We often find simple solution that cost less to a problem that may appear insurmountable without a big budget for the job. We can offer you these cost-effective solutions to problems that seem insurmountable without a major budget. We can offer you the cost-effective solutions to your building maintenance needs from high rise difficult rope access window cleaning to painting a complete building facade. Others companies require the use of expensive and disruptive industrial access equipment such as high rise scaffolding or cherry picker EWP to perform their works. On the other hand, our team will work directly on the area of concern by means of Industrial Rope Access and Abseiling Access. This considerable savings on expenses benefit none other than your organization and/or clients. Our specialized Team can offer a variety of qualification for abseiling access facade maintenance and industrial rope access solutions. We also have technicians that are qualified in their respective fields of specialty from industrial rope access concrete repairs to full rope access facade painting. Concrete repairs are required where a building has internal steel reinforcing that has started to corrode and resulting in the steel to expand and blowout including the concrete surrounding the steel. This is called spalling or concrete cancer, our team can re-mediate this issue by carrying out industrial access repairs to the external facade without the use of expensive and disruptive equipment. However, we offer more than the ability to repair concrete areas of your structure, we also offer cost-effective means to save you and your organization time and money. All of our employees are qualified in high rise difficult access building repairs where there is a need to access the external facade to perform various remedial repairs to a building facade. Concrete cancer can be a liability for any person below as spalling and or concrete cancer is because the internal reinforcing steel has corroded and there fore when the steel rusts it also expands and as a result it blows out the concrete on the surface leaving the internal reinforcing exposed. It is also a potential liability for passersby below as a piece of concrete as small as a 20c piece falling from a height can cause serious injury to them. We offer industrial roof safety system installation and design service, in compliance with Australian Standards AS4488 and AS 1891. We pride ourselves in keeping strictly within the confines of the legislation. We have built our system and maintained our practices to stay within the legal standards while maintaining a cost-effective project for you. We can offer you abseiling access services to perform any type of building maintenance task from facade painting, window cleaning, concrete repairs, rope access sign installation, technical rigging, stunt rigging and much much more. Advanced Solutions Group can provide you with all your height safety needs as we are approved installers for height safety access systems ranging from single anchor point installation to full safety static lines. Our team can offer you the complete service for height safety as we can custom design a fall arrest or rope access safety system starting from design to implementation as we have qualified height safety installers that are highly skilled in precision safety anchor engineering. We are approved to install the majority of safety brands available in the market and therefore we can offer you peace of mind that when your height safety system needs to work, it will function properly as it is meant to and possibly save someone’s life. We are specialists in single and fall arrest static line safety anchor systems, we can install Hilti Safe ring anchors into concrete substrate, 12-16mm stainless steel single safety anchors that are either bolted or chemically set into concrete or mechanical anchors. Height Safety is the key to safety in our tradesman community today as falls have become more frequent in our complacent society and as a result workcover has now made legislation in NSW that all buildings or work zone’s that require personnel to work in a areas that is within 3 meters of a fall zone and or a fall from height must be restrained in the event of a fall, this also includes working on sloped roofs, please refer to the latest WHS legislation here in the Managing the risk of falls in the work place. Also note that this includes working from a ladder, Workcover has safe working practices that requires anyone working in NSW must not perform any work on a ladder without being safely secured by some means. Please refer to the above link for more information or call us for advice to see what we can do to make sure your work is performed in a safe manner and in compliance with current legislation. “Who has health and safety duties in relation to falls? A person conducting a business or undertaking has the primary duty under the WHS Act to ensure, as far as reasonably practicable, that workers and other persons are not exposed to health and safety risks arising from the business or undertaking. A person conducting a business or undertaking has more specific obligations under the WHS Regulations to manage the risk of a fall by a person from one level to another, including requirements to: ensure, so far as is reasonably practicable, that any work involving the risk of a fall is carried out on the ground or on a solid construction provide safe means of access to and exit from the workplace minimise the risk of falls so far as is reasonably practicable by providing a fall prevention device, work positioning system or a fall arrest system. Designers, manufacturers, suppliers, importers and installers of plant or structures that could be used for work must ensure, so far as is reasonably practicable, that the plant or structure is without risks to health and safety. Designers of plant or structures have an important role in eliminating or minimising the risks of falls in the design stage (see Chapter 11 of this Code). Officers, such as company directors, have a duty to exercise due diligence to ensure that the business or undertaking complies with the WHS Act and Regulations. This includes taking reasonable steps to ensure that the business or undertaking has and uses appropriate resources and processes to eliminate or minimise risks of falls from one level to another that are likely to cause injury. Abseiling Access window cleaning has become the most cost-effective way to access and maintain the exterior windows on a building using Industrial Rope Access window cleaning to descend the external facade to clean any window on any building. 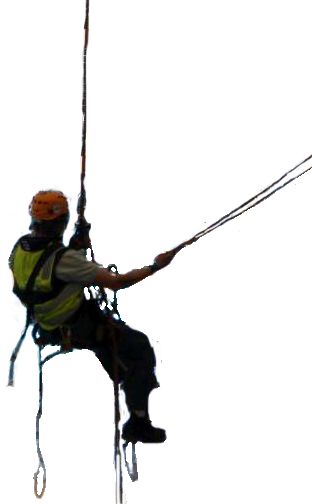 We can also provide other rope access cleaning services from High Rise facade pressure cleaning to soft wash facade rejuvenation all using abseiling access. We have rope access workers that can provide you with advertising or movie stunt work personnel including stunt safety rigging, we have worked on a number of films and TV commercials using abseiling access to carry out various stunts or safety rigging, if you require an actor or TV commercial performed in carrying out a stunt or move in safety, we can design and rig a full safety system in compliance with Australian Standards. Our team will amaze you with what they are capable to do and almost defy gravity to perform various abseiling access and or industrial rope access stunt works. All our personnel are qualified in industrial rope access works, all have experence in difficult access building maintenance.